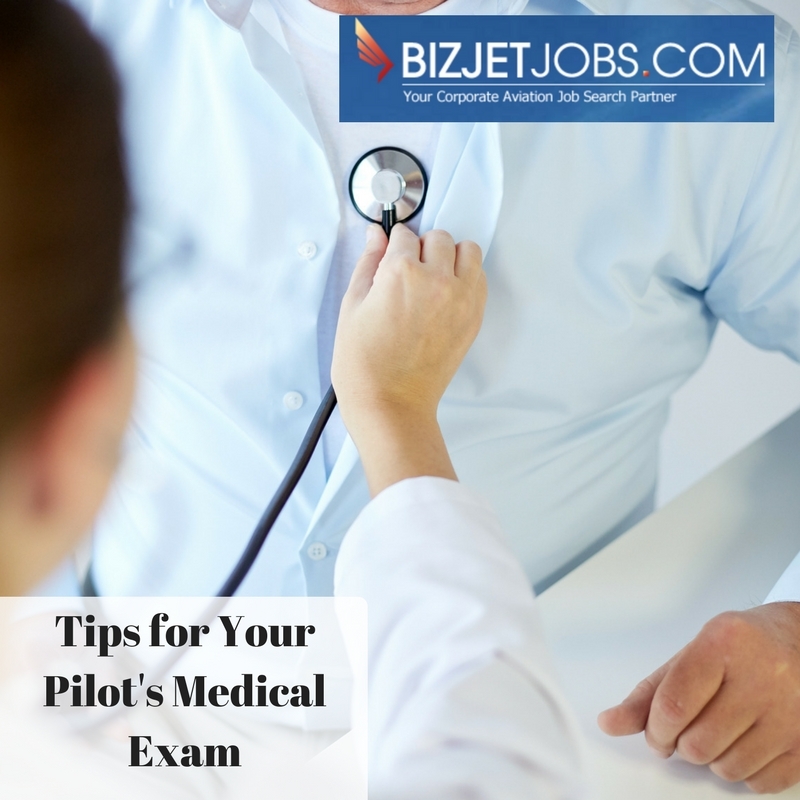 Recently, we at BizJetJobs have had multiple conversations with pilots who have lost their pilot’s medical certificate for various reasons. The issue seems to stick out that much more because our founder was hit by a car while out biking this last fall. Someone ran a stop sign, and it cost him his medical. Other stories include taking a nasty spill during a seated massage, and a pilot who did a weightlifting workout the morning of his FAA Pilot Medical Exam — then failed the blood pressure portion of the test. There are certainly some unexpected ways pilots lose their medical. During one of our regular staff meetings, the topic came up again and we started brainstorming about how we could help our member with issues around their Aviation Medical Certificate. What do you do if you think your medical might be in jeopardy? Are there best practices for getting it back if you lose it? How can you avoid losing it in the first place? While getting your medical back after an accident can be challenging, avoiding losing it in the first place is a topic that can help everyone. “An ounce of prevention is worth a pound of cure,” so Aviation Medical Exam tips for pilots seemed like the logical place to start. This post will be useful for both the young pilot who’s healthy as a horse – and the more seasoned pilot who would like to stay in the air as long as possible. I started researching, and talking to more pilots. There are definitely some “shoulda-woulda-coulda” stories out there, and simple things pilots do to keep the medical exam process going smoothly for years to come. Is your AME a pilot? Does your AME perform more than 25 exams per year? If your AME discovers a medical problem, will your exam be held for the allowed 2 weeks in order for your condition to be evaluated by your private physician? Will your AME contact the FAA to obtain special authorization if it will help you? Once you have an Aviation Medical Examiner who can answer “yes” to all of the questions above, you’ll need to schedule your exam and get ready. There are a lot of questions surrounding the aviation medical exam, and the typical corporate pilot passes easily. But knowing which health problems might crop up ahead of time will not only help you stay calm, it will help you navigate the process with more likelihood of passing. If you like to read government regulations or are extremely detail oriented, you may be interested in checking out the FAA’s Aviation Medical Examiner’s Guide. This way you’ll know exactly what your AME is looking for. Avoid caffeine, sodium or high carbohydrate / sugar food and drink for at least 8 hours prior to your exam. These can have more impact on your results than you realize. Lifting weights or working out hard the morning of your exam has skewed results for some pilots we’ve talked to. Save your hard workout for another day! You may want to go off of any vitamins, herbal supplements or dietary supplements you take. Get an EKG with your private physician. Don’t let them dismiss a “minor” variation; if anything is discovered, complete an evaluation and obtain documentation of the issue or condition. If you have been to the doctor for anything other than routine check-ups or general counseling, you should bring documentation to the FAA exam. Mild depression that is stable or completely resolved isn’t an issue. Major depression treated with medication will require a review by the FAA and a special issuance. Make sure you do your blood work with physicals at your private physician regularly, so that if any issues crop up (like thyroid, cholesterol etc.) you can nip it in the bud or get it under control. For example, most blood pressure medications are approved. Don’t drink any alcohol for at least 48 hours before your exam. It has been known to skew the results of the vision portion of the exam, among other things. Pre-test your blood pressure with your private physician. Values below 140/90 are preferred. Readings above 155/95 will earn you a “fail”. Most blood pressure medications are approved, so this pre-test will give you a chance to get any hypertension under control. For the Blood Pressure portion of your exam at the AME’s office, staying calm is the key. There is such a thing as “White Coat Hypertension”. Pilots have so much at stake that the exam itself can throw off results of things like a routine blood pressure test. So tell the nurse or administering physician you want to sit without talking for a few minutes before the test. Ideally, lie down and relax completely, bring your earphones and listen to soothing music or meditate. You can even find Blood Pressure Lowering Binaural beats and guided meditation on iTunes and YouTube. Get a hearing evaluation from a private physician to establish any need for hearing amplification. Most pilots with minor hearing loss are permitted to use a headset. If your AME uses an audiometric exam, take a pre-test. This happens, but not often! If you’ve completed the steps above, this shouldn’t be a huge surprise. If your medical certificate application was denied or deferred to the FAA for further review after your FAA Pilot’s Medical Exam, it doesn’t mean that you’ll be grounded forever. Aviation medical examiners (AMEs) rarely deny a certificate outright. Most of the time, they are encouraged and required to push it on to the FAA for review. Even if there’s no question that you clearly do not meet the requirements and your medical certificate is denied, you can appeal the FAA’s decision. For example, if you have a history of extreme substance abuse coupled with multiple arrests, this typically requires a denial on behalf of the examiner and the FAA. But if you can document that you’ve been to rehab and have been sober for at least 24 months, you may have a chance at an appeal. Switch medications to one that’s acceptable for flight. Wait until you’re symptom-free for a certain period of time. The FAA may approve your application easily. Example: people with hypothyroidism often have their applications approved, even though they’ll likely have to be deferred first. For most, the aviation medical exam is a routine they complete without any hiccups. For others, it can be frustrating to wait for the waiver process to be completed. But most of these non-serious stories end well, and the FAA will lets you keep flying in the end. Getting in the habit of prepping for the exam has saved even our healthiest members a lot of headaches. If you have questions or have experience dealing with issues around the Aviation Medical Exam, we would love to hear from you. Your stories and additional feedback will be held in the strictest confidentiality, but if you have advice that could help other BizJetJobs members, please get in touch by giving us a call today. This entry was posted in Blog, Hot Topics, Lifestyle, Pilot Advice, Pilot Jobs, Pilot Medical Certificate, Pilot Transitions by Amanda Jenkins. Bookmark the permalink.